For the location directly adjacent to the Royal Palace and National Museum, you can’t beat the price of this cheap and cheerful budget hotel. The best thing about budget hotel Diamond Palace II is its prime location directly adjacent to the Royal Palace and National Museum. You can catch glimpses of both, and of parts of the river, from the spacious communal balconies, which are sparsely furnished — perhaps to discourage hanging out there. 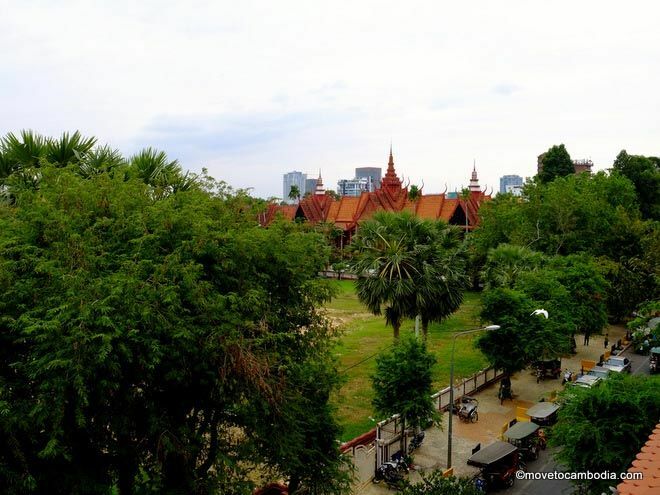 The view from the Diamond Palace II Hotel allows glimpses of Phnom Penh’s Royal Palace and National Museum. The room we stayed in was clean, if a little dim, with cool tile floors, toothpaste green walls, and extensive, ornate crown molding that made us feel like we were sleeping inside a birthday cake. Dimmable lights above the beds supplemented the standard bright fluorescent overhead light. We were happy to find a desk, mini-fridge, wardrobe, and tea kettle in the room, but the windows overlooked hallways and alleys, admitting little to no natural light. The street-facing rooms may be brighter but are likely to be quite noisy. If you like your walls like you like your toothpaste, you’ll love Diamond Palace II! One block of rooms overlooks the reception area and bar, which are populated mainly by a typical array of unwashed elephant-pants-wearing backpackers. Bathrooms could use a more thorough scrubbing. It’s often the case in Southeast Asia that an unenclosed shower will get everything in the room wet. But at the Diamond Palace II the standard bathrooms are so small that a quick shower really does soak the whole room, including the day’s supply of toilet paper. It’s all about location, location. location. Just ignore the decor, decor, decor. Note that those with limited mobility might want to book elsewhere — the hotel has at least three stories and no lift, and the stairs are narrow and awkward. The staff is kind and accommodating, however, and tuk tuks are easy to pick up right outside the front door. Given that it’s within walking distance to the Riverside area, and the bars and restaurants around streets 178 and 240, the hotel is a decent value if you’re able to score a room under $25. 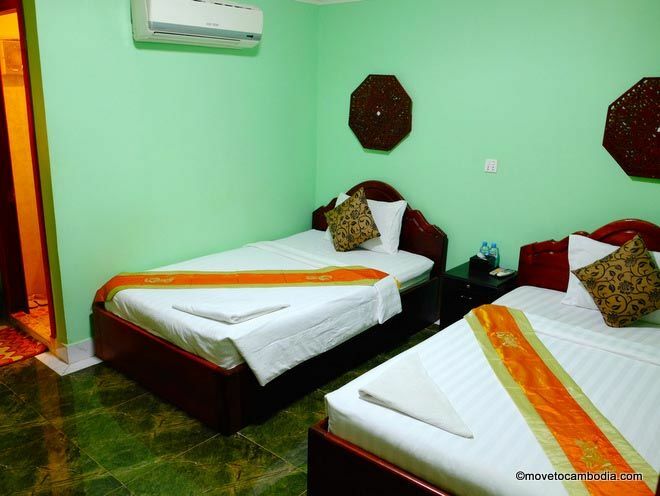 Prices directly through the hotel go as high as $70, so we suggest using Agoda or Booking.com, where we’ve seen prices as low as $17 in low season, and $23 in high season.